Fujitsu has long been experimenting with new ways for users to interface with technology. In the past they've shown off tablet that used its camera to create a virtual virtual keyboard, a hybrid digital interface based on paper, and they've shown off ereaders with new screen tech on more than one occasion. Fujitsu is in Barcelona this week for MWC, and today they showed off a new touchscreen tech that let users feel a texture. 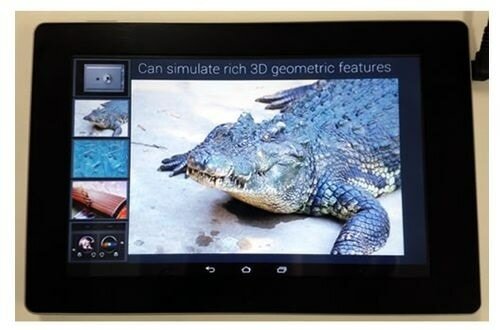 It's being displayed on a tablet, and according to Engadget the sensation is very convincing. They report that the slippery setting was quite convincing, and they were also pleased by the screens ability to convey and change several textures at once. The new tech reportedly works by emitting ultrasonic vibrations below the touchscreen. The vibrations can be pulsed with varying force on any part of the screen with varying results. For example, a rapid but irregular series of pulses will make the display seem rough or even bumpy, while steady high frequency of pulses can create a high pressure layer of air which will make the surface of the screen seem slippery. I can't find any details on how granular the pulses are; I for one would like to know if Fujitsu can focus the pulses on a thin row of pixels and not just large regons of the screen. This could prove useful when typing because it would enable you to keep your fingers lined up in the correct spots without having to look. This would enable touch typing, something you cannot do with touchscreens. According to my source, Fujitsu has 4 different examples to show off, including the strings of a harp, an alligator's scales, the dial on a money safe, and a DJ's mixing tablet, complete with CDs. Quick! Let’s patent using a safe dial as a means of unlocking a screen!